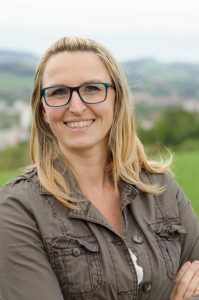 My name is Romana Hinterreither, I was born in Hagenberg and graduated in 2003 at the AKH Linz as a physiotherapist. After six months of employment with disabled children, I moved to the KH Elisabethinen Linz and gained professional experience in various fields. Since 2011 I have been working in the therapy center Elisabeth in Gallneukirchen. I am a freelance physiotherapist since 2012 and in between I also took on teaching activities at the Ludwig Schwarz Schools in Gallneukirchen. At the moment I am on parental leave (I have four children) and start in October 2018 with a few hours in the group practice of Dr. med. Reichel and Dr. med. Ritter. In recent years, I have specialized in fascial therapy and lymphatic drainage, where fascial therapy can be used in all kinds of orthopedic and post-traumatic conditions. As a long-term physiotherapist, I have already attended many training courses, but a particular challenge for me now is the osteopathy training, with which I will start in October 2018. I am looking forward on working with Dr. med. Reichel and Dr. med. Ritter! If you would like to hire me as a physiotherapist, then get at first your family doctors a referral note for physiotherapy and then contact me on 0650 3631138. I am happy about your trust!